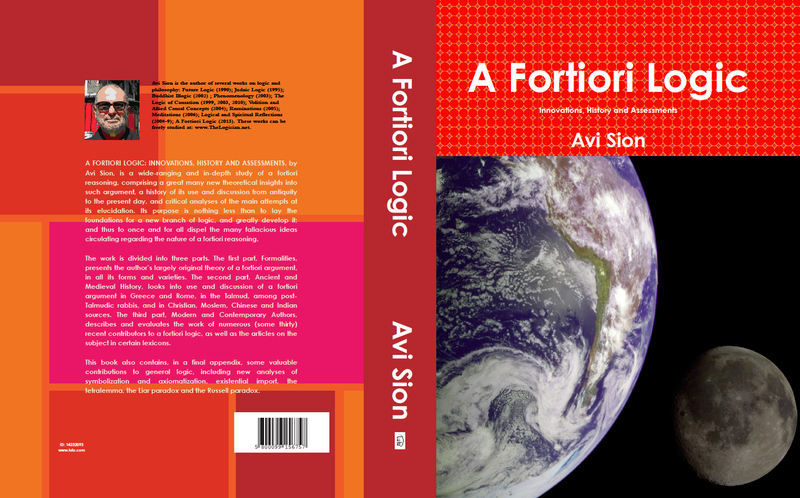 A Fortiori Logic: Innovations, History and Assessments, by Avi Sion, is a wide-ranging and in-depth study of a fortiori reasoning, comprising a great many new theoretical insights into such argument, a history of its use and discussion from antiquity to the present day, and critical analyses of the main attempts at its elucidation. Its purpose is nothing less than to lay the foundations for a new branch of logic and greatly develop it; and thus to once and for all dispel the many fallacious ideas circulating regarding the nature of a fortiori reasoning. © Copyright Avi Sion, 2013. Published in 2013, by Avi Sion in Geneva, Switzerland. It would have sufficed us [if He had done us any one or more of these many listed kindnesses, yet] how much more good, many times more and still more, did God [blessed be He] bring upon us! A Fortiori Logic is divided into 33 chapters, and 7 appendices. To navigate through it, use the buttons at the top (to choose a book), on the left (to choose a part or chapter) and at the bottom (to go to the next or previous chapter within a part), and of course your browser’s back and forward arrows (to return to previously seen webpages). You can also use the General Sitemap.